The promotion of health and prevention of disease must become the central focus of medicine. An aging population that is growing in size, successes in the treatment of infections, and the surprising decline in mortality from cardiovascular disease and stroke in the last 50 years —largely resulting from preventive measures — have all contributed to dramatic shifts in clinical medicine from care for acute to chronic degenerative and neoplastic illnesses. In only one generation, diagnoses of chronic illness will double, and advances in treatment cannot alone avert this unsustainable burden on our society. Current societal costs of chronic illnesses are already staggering. Seven of ten deaths in the United States are from chronic diseases, and consume 98% of Medicare expenditures. Although prevention and treatment during early stages of disease development are easier and cheaper, vast sums of money continue to be allotted to treating later stages of cancer and other chronic illnesses while prevention/protection have remained largely neglected. It is imperative to develop imaginative new strategies to reduce the risk, delay the onset, and slow the progression of chronic degenerative and neoplastic diseases. Whereas total life expectancy at birth has doubled in the last century, maximal life span has remained constant (near 114 years). Thus the goal of preventive/protective medicine is to increase the period of “wellness.” in our lifespan. 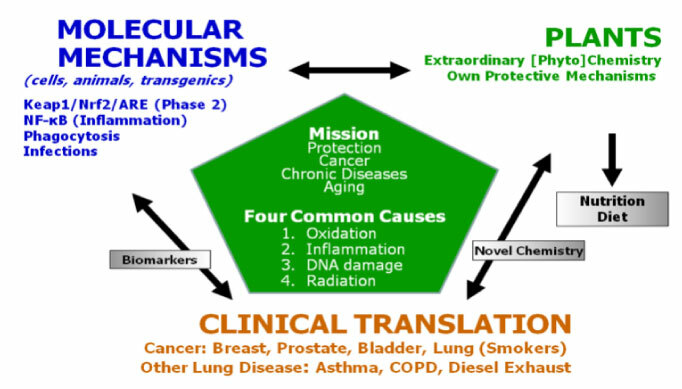 Four life-long and continuous pathological processes cause cancer and other chronic diseases: oxidative stress (largely of endogenous origin); injury by DNA-damaging agents (originating largely from food and the environment); inflammation; and radiation (principally solar ultraviolet). Our studies of the fundamental signaling mechanisms of disease generation and prevention have benefitted enormously from the wealth of knowledge provided by plants with their extraordinary variety of protective (phyto)chemical components. The protective mechanisms developed by plants – through longer evolutionary processes – are relevant to protection of mammalian cells, and their elucidation is a major component of our Chemoprotection Program. Aerobic cells are equipped with elaborate and highly effective intrinsic defenses to counteract the principal pathological processes that lead to chronic diseases. These protective systems do not normally operate at their maximal capacity and also decline with aging. Cytoprotective phase 2 genes are a universal defense system that can be effectively boosted to higher levels of expression via the Keap1/Nrf2/ARE signaling system. Edible plants contain many phytochemical components that upregulate these protective systems and their consumption reduces disease risk. The isothiocyanate sulforaphane , which was isolated at Hopkins from broccoli in 1992, is one of the most potent activators of the upregulation of cytoprotective genes and can be efficiently administered to humans by consumption of 3-day-old broccoli sprouts. This dietary approach is simpler, safer, and more economical than the introduction of novel synthetic agents (“drugs”). We are now refining our understanding of the mechanisms that regulate cytoprotective genes, with respect to both the signaling pathways involved and the chemical characteristics of the inducers, thereby identifying quantifiable biomarkers of chemoprotection. 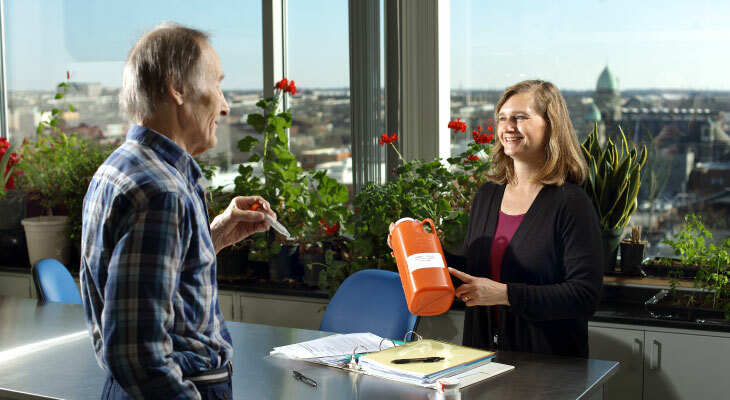 Clinical studies of the effects of these chemoprotectors on a wide variety of cancers (breast, lung, prostate, and skin) as well as lung diseases including COPD and asthma are already in progress and are yielding promising findings. We are expanding our research program to integrate three strategic approaches: 1. Fundamental studies of the molecular mechanisms of the signaling pathways that underlie disease development and prevention. 2. Study of dietary plants to capitalize on the extraordinary variety of their own chemoprotectors, and the mechanisms that plants have developed for protection against adverse environments. 3. Translation of information obtained from plants and molecular mechanisms to the clinic to achieve preservation of long-term health. The goal is to identify novel opportunities for modifying human nutrition to develop protective diets that will reduce the risk of malignancy and other chronic diseases, and prolong the period of wellness in our lives.